We often get asked what our favorite recipes are for using the products that we sell in our retail shop. Well here they are! 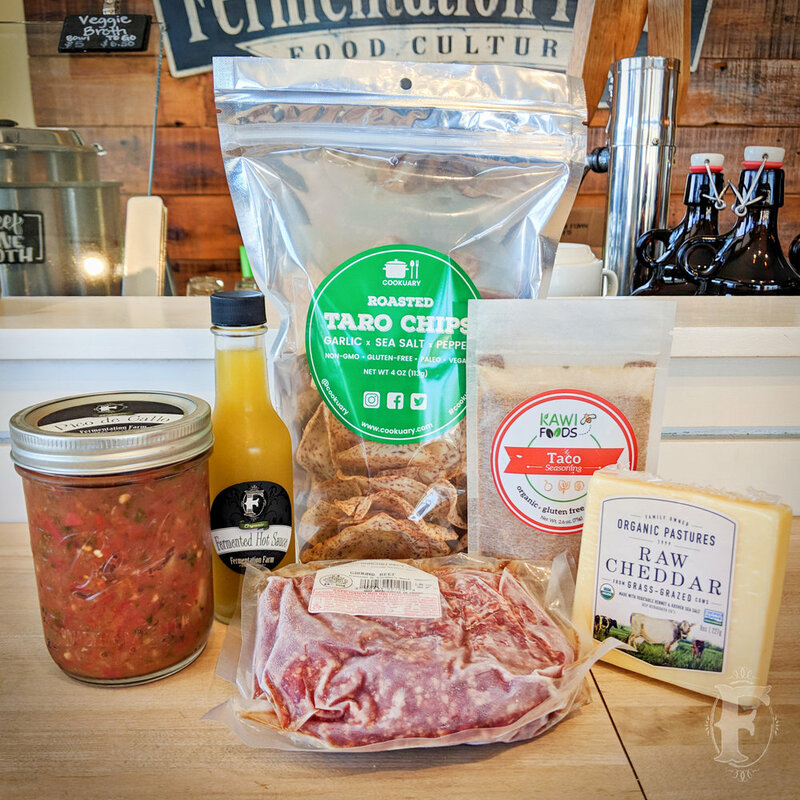 Each of these items can be purchased in our retail shop and combined into the recipes that you see below. Plus, we add a new one every month! Combine these 3 items to make delicious Bacon-Wrapped Dates with Sprouted Almonds! 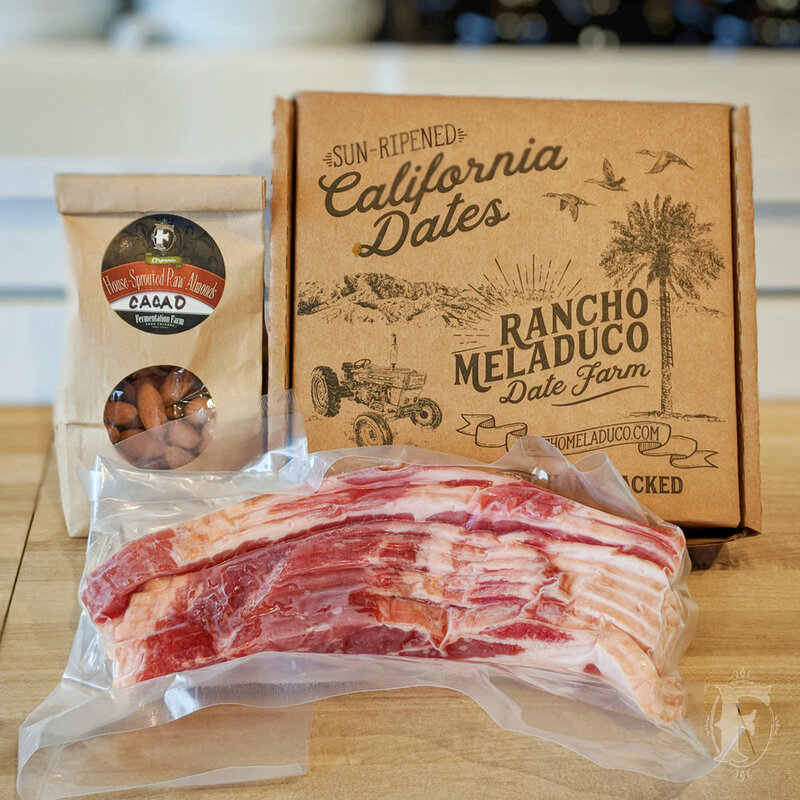 Pop the pit out of the date, place the sprouted almond in the date, wrap the date in a half piece of bacon, secure with a toothpick, and bake at 400 degrees for around 15 minutes! Enjoy! Combine our Dilly Beans with Diamond Mountain Ranch's grass-fed salami and Cultured Provisions' Chive On cashew cheese spread to make a delicious appetizer! Thinly slice the salami, spread a small layer of cashew cheese on the salami, place a dilly bean in the center, spear the salami together with a toothpick, and try not to eat the whole tray! A great way to cool off during this heat wave is to throw a shot or two of our Organic Elderberry Syrup into your Mountain Valley Sparkling Water for a fun immune-boosting spritzer! Healthy popcorn for your next movie! Place a couple tablespoons of Ancient Organics Ghee in a large pot and add a cup of Gluten-Free Sprouted Popcorn to evenly cover the bottom of the pot. Heat the pot to medium and shake the pot back and forth until you hear the first pop. Then cover the pot with a lid until all of the popping stops. 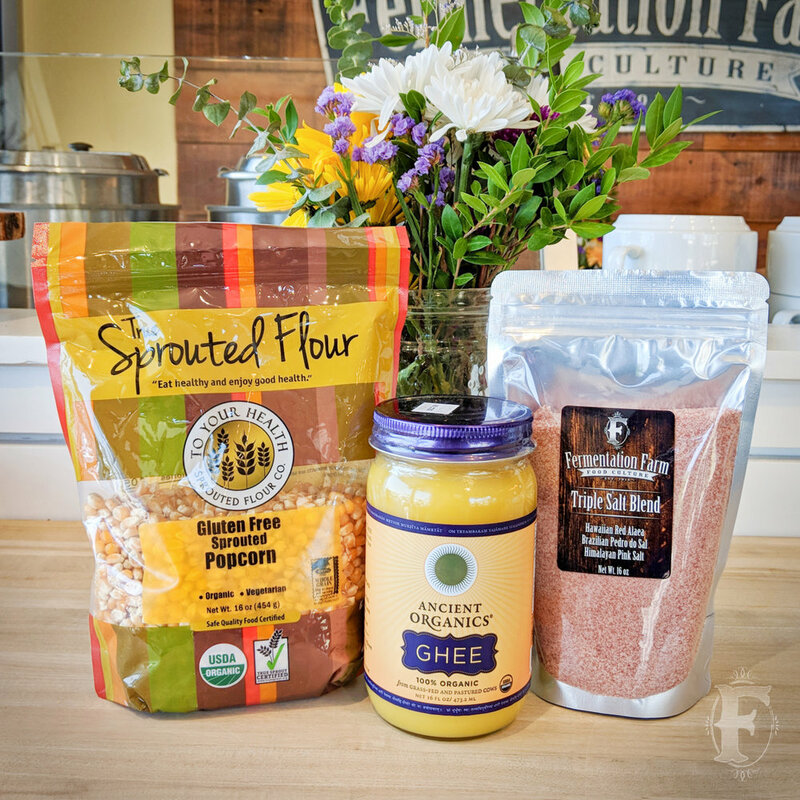 Place all of the popped popcorn in a bowl, add a little more ghee, and season with our Triple Salt Blend! Have a jar of kimchi that has gotten too sour for you? Our take on Kimchi Jjigae or Kimchi Stew will put that kimchi to work! In a pot, heat up some ghee and place a pound of your favorite meat in. Buy Ranch Direct's Ground Pork works really well here! Then add 3 tablespoons of our Gochujang and sauté the pork on medium until fully cooked. Add in a full 16 oz. jar of one of our kimchis along with a 24 oz. jar of our chicken bone broth. Yes, this does kill the probiotics. Let simmer for 20 minutes and you now have an amazing Spicy Pork Kimchi Jjigae! Pro Additions: Boost nutrition with Beef Boost, up the collagen with scoops of Collagen Hydrolysate, or top your bowl with some cold kimchi to get those probiotics back in. Enjoy! It's Nacho Average Nachos! First, cook up some Buy Ranch Direct Ground Beef with Kawi Foods Taco Seasoning, then toss that on some Cookuary Roasted Taro Chips. Shred on some Organic Pastures Raw Cheddar Cheese and heat up briefly to lightly melt the cheese. Scoop on some fermented Pico de Gallo or Hot Sauce for nice little kick and enjoy! Heat up your favorite cooking oil in a pan, add the Buy Ranch Direct chicken thighs and cook over high heat until nicely browned on all sides. Turn down the heat to medium high and add Mike's Organic Curry Love Yellow Thai Curry Paste. Stir-fry for another 2 to 3 minutes until fragrant. Add the can of organic coconut milk and bring to a slow simmer for about 8 to 10 minutes. Serve with steamed jasmine rice and make sure to cook your rice in our organic bone broth! Enjoy! Add a jar of defrosted Chicken Bone Broth to a saucepan, bring to boil, and then add 1.5 cups of Sprouted Flour Oat Groats. Cover and simmer for 40 minutes. Then uncover and reduce heat to low and cook for an additional 15 minutes, stirring occasionally. Heat 1 tbsp of Avohass Avocado Oil and 1 tbsp of Organic Pastures Raw Butter in a skillet on medium until butter is melted. Add your favorite diced veggies to the skillet like carrot, onion and celery. Cook until tender, about 10-15 minutes, then add chopped garlic and thyme along with coarsely chopped Sprouted Almonds and cook for about 30 seconds. Add the Oat Groats and remaining bone broth to the pan, reduce the liquid and season with salt and pepper. Enjoy! Here's a quick snack or dessert that will definitely excite the palate! Grab a box of Rancho Meladuco Dates, split them in half lengthwise and remove the pit. On each date slice, spread about a half tablespoon of Asana Foods Maca Buddah or your favorite nut butter, and add a small sprinkle of our Triple Sea Salt Blend. Then devour!